Your natal Saturn shows where you can have a difficult time in life because you have lessons to learn. Once you learn the lessons associated with your Saturn, life gets a lot easier, but it tends to take time. With your natal Saturn in Aries, it takes time for you to figure out how to use your energy, draw enough energy when you need it, and have a drive in life. You become more assertive, confident, independent, and pioneering as you get older, and are more reserved and cautious when young. You have to learn to be more of a risk-taker and bold. With your natal Saturn in Taurus, you’re not a fan of change, preferring to keep things as they are. When you do make changes, they’re implemented at a crawl. Over time, you become better at speaking, and people listen to you. You crave security, but you usually don’t need too much. You have to work hard for what you have. With your natal Saturn in Gemini, you have a great ability to solve problems, and can do well in math and science. Some of you may struggle with learning, but you don’t forget anything that you do learn. Learning becomes easier with age. To you, facts are king, and you can sort through details with ease. With your natal Saturn in Cancer, you need a safe, comfortable home and family life. You do whatever it takes to achieve that, sometimes sacrificing too much. You’re quite protective of your family. You may have things in your past or issues with family that hold you back. You try not to show how you feel to others, especially early in life. With your natal Saturn in Leo, you have a great need to express yourself, especially creatively, yet it’s difficult for you to be heard, and you can expect too much from yourself. You may suffer greatly with low self-esteem and lack confidence. You want people to admire you, and this can drive you. With your natal Saturn in Virgo, you’re extremely responsible, perhaps too much so at times. You feel like you have to be productive or you’re useless. You’re an excellent worker but may not be good at anything else if you don’t work on being well-rounded. You don’t take risks, are concerned with small tasks, and are too hard on yourself. With your natal Saturn in Libra, you don’t want to fight with people. Instead, you want to find middle ground and compromise. You can have a hard time connecting with others, and for many of you, marriage and commitment doesn’t come early or easy. You seek people out though, needing people around you, yet push them away. With your natal Saturn in Scorpio, you work hard to have control over yourself. You may control yourself too well, and not know how to let yourself go. Transforming yourself may be a way for you to attain more power in your life. Your will is strong, but you try not to come across as intense as you may actually be. With your natal Saturn in Sagittarius, you take your beliefs seriously. You believe in them strongly, and can have a hard time being open-minded and accepting of other views, yet you try hard to appear to be open. You may have had a hard time with school early in life, and had to teach yourself. With your natal Saturn in Capricorn, you set your mind to your goals and work hard to achieve them in spite of it taking a long time. You can question them, but you’ll keep going. You can be ambitious and want to be successful, and you’ll take the slow, steady approach, so it will likely be when you’re older. With your natal Saturn in Aquarius, you can come up with innovative ideas, but not stray too far from the norm. You may not think there’s much to look forward to in life when young. Trying to help humanity may be important to you. You want friends but may be emotionally distant and lack intimate relationships. With your natal Saturn in Pisces, you can sacrifice anything in the name of your spirituality. As long as you believe that things will turn out okay, you can withstand any difficulties in the present. You’re very sensitive and can feel like the world is out to get you at times, and your spirituality can help you with that. With your natal Saturn in your 6th house, you’re a hard-worker and won’t put play ahead of work. Work has to be done before anything else can happen. You might be addicted to working, but not have much to show for it. You can work simply to work and provide for yourself or others, but not out of any joy. As you get older, you can figure out what you like working at and veer into work that is pleasurable. You can also be very health-conscious and concerned with healthy living. Some of you may have a health issue that’s worse as a child but gets better as you get older. Since the 6th house rules work, with Saturn here, you could work in politics, government, in business, as a CEO, executive, some sort of leader, manager, or in the public eye. With your natal Saturn in your 9th house, you’re not someone who lives in their imagination. Your beliefs are practical and you connect with reality. The problem is, without a little whimsy, life is stale, boring, uninspired, and lacks fun. You also need to open yourself up more to other beliefs. Your way isn’t the only way, and other people are entitled to their own beliefs. Being more open doesn’t mean you abandon your own beliefs, but that you allow other people to be who they are. The 9th house rules higher learning, so this placement can show a delay in pursuing education beyond the basics, and you could go to college or pursue training later. It could be that you don’t know what you want to study, struggled in school, or have some other block. With your natal Saturn in your 10th house, your career is important to you, and you take the work required seriously. You may have a hard time finding a career or being successful in your career until after your first Saturn return (when Saturn returns to the exact placement it was at when you were born; occurs in your late 20’s or early 30’s). You may become more successful later in life, and generally get better with age. It takes time for you to not feel the weight of people’s attention, and it’s something that makes you uncomfortable for some time. You work hard and take your time, not in any rush to attain your goals. Since the 10th house rules your career, with Saturn here, you could have a career in politics, government, in business, as a CEO, executive, as some sort of leader, manager, or in the public eye. With your natal Saturn in your 12th house, you believe that you should deal with your responsibilities on your own, and that your burdens are yours alone. You have a hard time allowing other people to help you with your problems, and can isolate yourself as a result. Guilt, insecurity, and anxiousness can plague you, and the more you withdraw, the worse it gets. You may run away from your problems, afraid of dealing with them. Growing up is hard for those with this placement, and there’s usually something in your past that weighs on you and holds you back. You have to learn to let go and to let other people in. You won’t find the happiness that you need until you do. With your natal Moon conjunct natal Saturn, you’re a serious person, sometimes too much, and you come across as practical, distant, and cautious. You’re more sensitive than you want people to know, and you keep people at a distance, but deep down, you need support. You’re good in professional settings because of your ability to keep your emotions out of it and not take things personally. Life seems better and you seem more comfortable in your own skin as you get older. With your natal Moon sextile or trine natal Saturn, you can show restraint easily, but not hold yourself back too much. When stressed, you don’t waver. You’re patient, take a practical approach, and are responsible. You try to make good decisions, and you think about how those decisions will impact you and everyone else. With your natal Moon square or opposite natal Saturn, you tend to be insecure and doubt yourself too much. You question people’s motives, especially when they’re being nice to you, subconsciously believing that no one can really care about you. This sets you up to fail in relationships, so you have to work on changing this belief by tackling whatever caused you to think this way in the first place. With your natal Venus conjunct natal Saturn, it can be hard for you to show how you feel and express your love. You worry about being rejected, about not being loved, and have a hard time letting yourself live in the moment. You’re fiercely loyal and dedicated to your partner, and need someone who appreciates that. You can seem cold on the surface. With your natal Venus sextile or trine your natal Saturn, you don’t feel the need to jump into a relationship quickly, but you don’t wait longer than you should either. You have less of a problem with commitment, and are a loyal person. You can handle any difficulties that arise in a relationship easily. With your natal Venus square or opposite your natal Saturn, you can have a hard time expressing the love you have for someone. Something stands in the way, and you have to confront whatever it is first before you can open yourself up. You may have a better time managing this aspect as you get older, and you learn to lighten up a little. With your natal Mars conjunct your natal Saturn, you have incredible discipline and patience, but you can go too far. You keep yourself from doing what you want, and you can miss out on opportunities, and you can walk away from projects before finishing them at the worst moments. Keep physically fit so you don’t suffer health-wise. With your natal Mars sextile or trine your natal Saturn, you understand that slow and steady wins the race, and you take that approach to whatever your goals are. You can make practical plans that help you succeed, and work hard to make it. With your natal Mars square or opposite your natal Saturn, you’re way too hard on yourself. You don’t give yourself any room to be a normal, flawed human being, and need to give yourself a break. You can work hard for what you want, but sometimes, you’ll work hard and keep going nowhere. You have to keep going no matter what and resist giving up. Don’t hold yourself back. With your natal Jupiter conjunct your natal Saturn, you’re not usually too enthusiastic or optimistic, and take a more cautious approach. You may be a late bloomer, and don’t see things really come together for you until after your first Saturn return. When you dream, you don’t dream too big, always being practical. You go about attaining your dreams in a thoughtful way, slowly, and deliberately. With your natal Jupiter sextile or trine your natal Saturn, you believe in yourself and in your ability to make what you want happen through simple hard work and determination. You can be productive, efficient, and practical, but not overly so. You can balance optimistic and realism well. With your natal Jupiter square or opposite your natal Saturn, you can be too hard on yourself when you don’t succeed, and you don’t let yourself ever forget when you don’t, torturing yourself over it for life. You have to work hard and stay the course and not look for easy ways out. Once you have self-discipline, you can achieve more in your life. With your natal Saturn conjunct your natal Uranus, you try to mesh together creativity and innovation with tradition and convention. You find a way to bring the two together that other people wouldn’t be capable of. At times, you may feel pushed or pulled in one direction or the other, but you should try not to give in to choosing one over the other. Both are important for you, and you need to bring both into your life. With your natal Saturn sextile or trine your natal Uranus, you’re comfortable with both the traditional and innovative. You can go between them smoothly, and understand how to bring in the new while preserving the old. You can be practical in unusual ways, and be unusual in practical ways. With your natal Saturn square or opposite your natal Uranus, you can have a hard time balancing the old with the new. You may stick to doing things the way that they’ve always been done, but want to be original and inventive. You can’t let yourself become complacent otherwise trouble finds you. You need to stop being so serious and let loose sometimes. When you’re creative juices start flowing, let them flow, and see how you can utilize your ideas in practical ways. With your natal Saturn conjunct your natal Pluto, you have incredible self-discipline and a determined personality. Nothing can stand in your way once you set your mind to something, and you can become obsessive about your goals. You have learn to pull back a little and let yourself breathe and have some joy. With your natal Saturn sextile or trine your natal Pluto, you take responsibility for what you do so you remain in control of your fate. You like the feeling of being in control of your life. When you encounter obstacles, you don’t let it stop you, and even if you falter, you won’t stop. 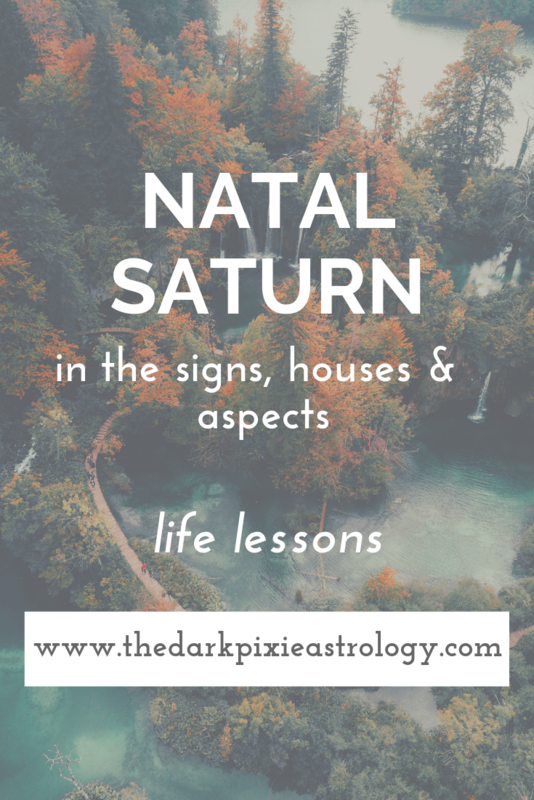 With your natal Saturn square or opposite your natal Pluto, you have a strong will that can help you get through any difficult situation if you don’t allow yourself to get stuck in it. As long as you can do that, you can survive anything, but it’s likely that life will throw problems at you for some time until you learn how to do that. With transit Moon conjunct your natal Saturn, you’re in control of your feelings and not the other way around. You can make sound decisions with your mind rather than being led astray by your emotions. This is good for business matters that require you to keep a cooler head. You’re more realistic about what you can attain, and you can get a lot of work done. Depending on what’s going on at the time of the transit and how you lean normally, you can feel lonely or empowered. Most of what is handed to you, you can deal with. With transit Moon sextile or trine your natal Saturn, you’re also in good control of your emotions, and you feel okay with forgoing pleasure for the moment to work. Your mind is clear and people find you dependable, though they may also see you as isolated. Any responsibility you have to handle can be done with aplomb. Your self-discipline and self-control are higher. Whatever work you set out to accomplish now can have rewards later. With transit Moon square or opposite your natal Saturn, you can feel bogged down with life. Pessimism is higher, and your duties may overwhelm you. There can be roadblocks and delays with what you’re trying to accomplish. People may take you for granted, or you’ll feel that way. You may feel like you’re alone on an island, misunderstood, or restrained. Energy is low and you may feel like just locking yourself up for the duration of this transit. When transit Mercury is conjunct your natal Saturn, you have incredible focus right now. You can concentrate on a project or idea and make headway. You have a realistic approach, and know just what you need to do to make things happen. You can have an important conversation, or get organized. When transit Mercury is sextile or trine your natal Saturn, you can bring structure and order into your life and make preparations. Your mind is clear and while you may not say much to people, what you do say is important. You’re more attuned to serious situations. When transit Mercury is square or opposite your natal Saturn, you can encounter a block, delay or challenge with whatever you’re working on. You may have a hard time dealing with people, and they seem extra mean. You may doubt yourself. With transit Venus conjunct your natal Saturn, you seem more practical and mature in your relationships, and you want the people around you to be the same way. You have an easier time dealing with parents, bosses, mentors, and those older than you. You might prefer to be alone today and not socialize. You can commit to something now. With transit Venus sextile or trine your natal Saturn, you’re stable and realistic about your relationships. You can commit more easily. You don’t want to take risks, preferring to go slow and steady. This can be a good day for business. With transit Venus square or opposite your natal Saturn, you have a hard time dealing with other people, and either you stay away or they feel distant. You worry about your relationships, or some relationship issue could be of great concern. You may not want to socialize, feeling anxiety about it, and stress about feeling unloved. With transit Mars conjunct your natal Saturn, you’re now fully aware of your limits. The reality of your limits may be frustrating to you, but you can try to work within these limitations constructively. Get your house in order and bring some structure to your life. With transit Mars sextile or trine your natal Saturn, you can concentrate your drive and energy, allowing you to get much more work done than usual. This is a productive and efficient time. You use just the right amount of energy needed for each project. With transit Mars square or opposite your natal Saturn, reality is frustrating for you. You know all of your limitations, everything that’s stopping you from being where you want, and you want to blast through it but shouldn’t. Blowing up will only make things worse.